Book ski lessons in Kaprun! Picturesque, family friendly, genuine and cozy. These are some of the words often used when describing Kaprun, one of Europe's most popular ski resorts. During your holiday in Kaprun you will explore Austria's finest nature from its most flattering angle, regardless of what time of the year you decide to go! Kaprun is a municipality in the Zell am See district in the state of Salzburg, Austria. It is located at the foot of the Kitzsteinhorn mountain and can be reached with the Gletscherbahn. When finally up in the mountains broad slopes with top class snow, snow parks and Austria's biggest super-pipe for freestylers await you. The Kitzteinhorn-glacier offers 41 kilometres of slopes and reaches up to an impressive 3023 metres above sea level. It therefore offers you many long and beautiful rides in the slopes and in combination with the priceless view of the whole Schmittenhöhe-area, Kaprun is the perfect ski holiday destination! If you are interested in exploring other parts of the Schmittenhöhe skisystem, it's very easy to take a bus from Kaprun to Zell am See. If you are dreaming of an unforgettable ski holiday in the Austrian Alps, Kaprun is a fabulous destination no matter what kind of skier you are. 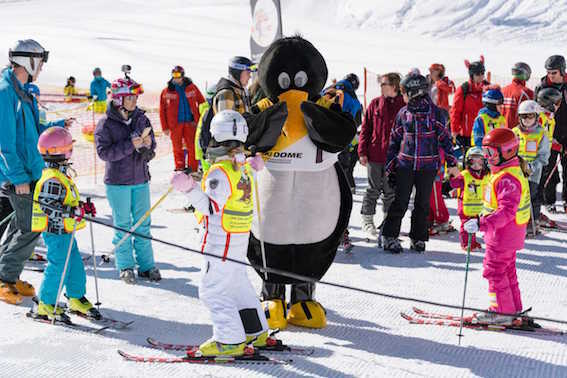 Our partner in Kaprun, Ski Dome Oberschneider, is especially ideal for families. Parents can warm up on a slope right next to the childrens' slope. An international staff is ready to answer all your questions. In Kaprun a safe, secure and fun ski holiday awaits you! In Kaprun you will never be bored. Aside from the endless skiing possibilities that Kaprun has to offer, you can enjoy a lot of other activities. Refuel with new energy at the Tauern Spa or go for a drink in the neighboring urban village of Zell am See.